Today, you’re getting a first-person view of a BONEBRIDGE implantation. As part of the MED-EL Surgical Video Library, this surgical case study is presented in crystal-clear 4K HD. You’ll have a clear view of surgical techniques and anatomical structures, including creating a sub-periosteal pocket, creating a recess in the mastoid, and proper fixation of the BC-FMT using the torque wrench. In this surgical case study, Prof. Dr. Assen Koitschev demonstrates his techniques for implanting the BONEBRIDGE (BCI 601) Active Bone Conduction Implant. 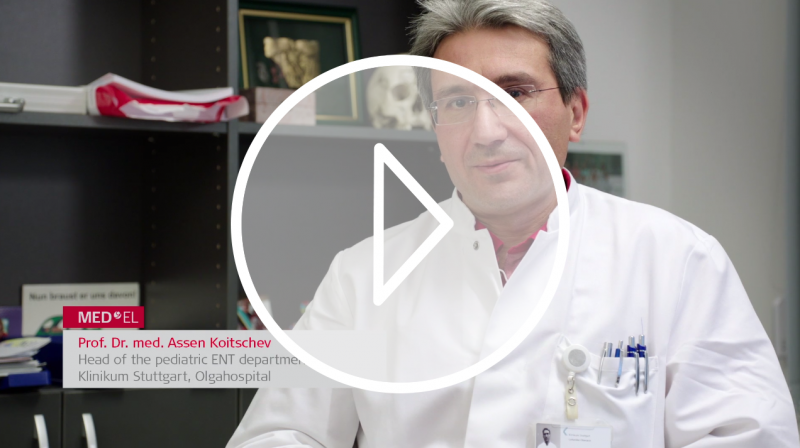 Prof. Koitschev is Head of the Pediatric ENT Department at Olgahospital, Klinikum Stuttgart. In this case, the 11-year-old male patient has severe conductive hearing loss caused by aplasia of the pinna of his left ear. His bone conduction thresholds are normal. For this patient, Prof. Koitschev uses the BONEBRIDGE (BCI 601) Bone Conduction Implant. BONEBRIDGE is an active bone conduction implant with transcutaneous connection to the audio processor. This minimizes any risk of skin complications while providing direct-drive sound transmission without energy losses through the skin. This enables excellent hearing outcomes combined with superior wearing comfort. BONEBRIDGE is an ideal treatment option for conductive or mixed hearing loss. BONEBRIDGE can also be an effective treatment option for single-sided deafness when a cochlear implant is not suitable. 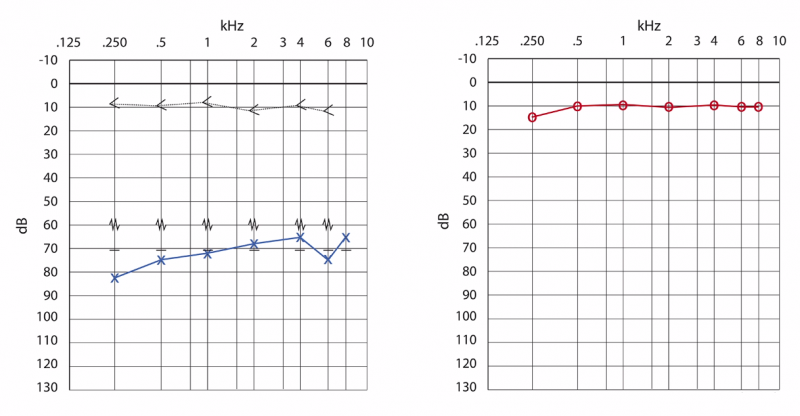 Pre-operative audiogram of this pediatric patient showing severe conductive hearing loss in left ear, with normal bone conduction thresholds. 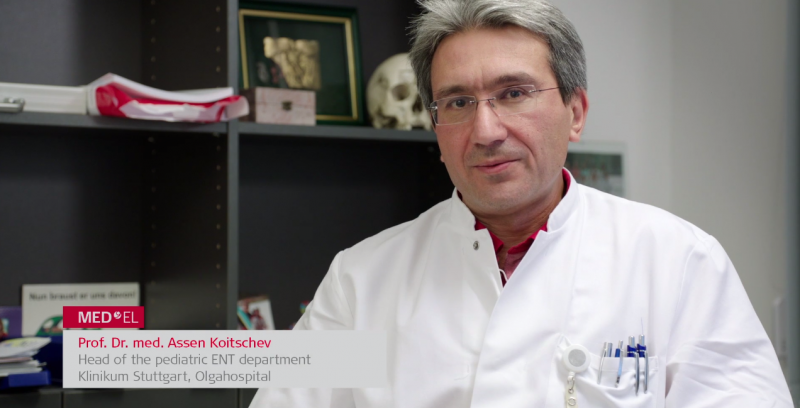 Watch now: Prof. Koitchev demonstrate his surgical techniques in this high-definition bone conduction implant surgical case study (8 minutes). Want more surgical case studies like this? Check out the MED-EL Surgical Video Library for access to all our video case studies. Find out what sets BONEBRIDGE apart from any other active bone conduction implant in this professionals guide. We’ll be posting more hearing implant case studies here on our MED-EL Professionals Blog—don’t forget to subscribe!